I have a pair of these headphones got them on a deal from Very a few week back. But this is the best price I can see for them now. These are sometimes hard to come by. Fantastic Bluetooth headphones but create a sore point on top of head sadly. Needs more padding for big heads. Whooping 5% off!!! How’s this going to be publicised to make an impact? 5 s not a very big number! Especially of 330! My mates nan has these. She's as deaf as a post, but still. Whooping 5% off!!! How’s this going to be publicised to make an impact? 5 s …Whooping 5% off!!! How’s this going to be publicised to make an impact? 5 s not a very big number! Especially of 330! Has anyone ever made less sense? To use your speaker comparison, better headphones can produce clearer sound, more dynamic sound and better base. Having great headphones can also be more immersive similar to great speakers with a sound stage that makes you believe you are sitting in the middle of a concert hall. Only gotten into headphones more the last couple of years myself and the differences can be huge. In saying that not every pair is for everyone. £100 pair could sound better than a £500 to some people. I have got P7 wirelss but I still prefer Master and dynamics MH40, I would suggest MW60. I paid about £300 for my subwoofer, still can't understand why domestic headphones have such a high price tag. I paid about £300 for my subwoofer, still can't understand why domestic …I paid about £300 for my subwoofer, still can't understand why domestic headphones have such a high price tag. Because they aren't sold by the kilo. You really can't understand that? I think that's a given as these are probably more expensive than truffles but that's hardly the point is it. What justification is there really for the high price of high end domestic headphones. The mark up on these devices must be incredible to say the least. I have the P7W and temporarily had the PX. In my opinion, everything - looks, comfort and sound - is better on the P7W. 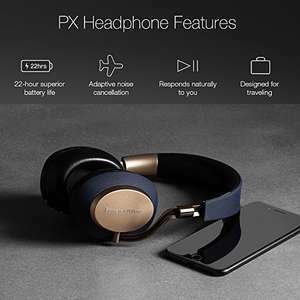 Fantastic Bluetooth headphones but create a sore point on top of head …Fantastic Bluetooth headphones but create a sore point on top of head sadly. Needs more padding for big heads. A couple of reviews said this and now it just gets repeated by people who have never worn them or at best have tried them on in store. I have these, wear for 2 to 3 hours a day and they do not make my head sore one bit. A couple of reviews said this and now it just gets repeated by people who …A couple of reviews said this and now it just gets repeated by people who have never worn them or at best have tried them on in store. I have these, wear for 2 to 3 hours a day and they do not make my head sore one bit. Difference is I have bought and tried these headphones as I do with most new listening products. They were returned. This is my opinion and you don't know me to make the assumption I'm just parroting someone elses review. Also just because these headphones are comfortable for you does not make you the majority, as you mentioned this is commented on in reviews as a real negative. One of my work colleagues bought these at these at the same time as I did but kept them. He also says they create a sore spot on his head but is willing to live with it because they sound so great. As I said, great headphones but not comfortable for me and others. A fair point to raise for an expensive pair of headphones.